LITTLE ROCK, Ark. 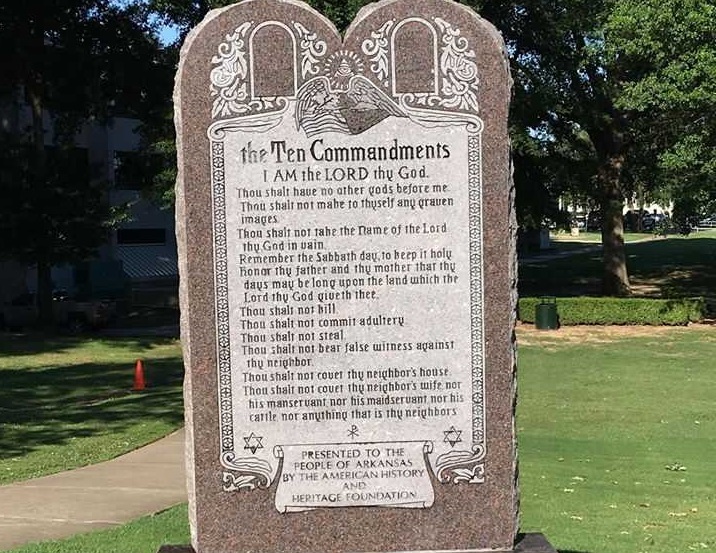 — The American Civil Liberties Union of Arkansas, representing four female atheist and agnostic complainants, and the Arkansas Society of Freethinkers, along with the American Humanist Association and the Freedom From Religion Foundation, have filed lawsuits challenging the placement of a Ten Commandments monument on the grounds of the state capitol building. “The Commandments do not confine themselves to arguably secular matters, but also govern the religious duties of believers: worshipping the Lord God alone, avoiding idolatry, not using the Lord’s name in vain, and observing the Sabbath Day,” one of the lawsuits states. “The State of Arkansas may not, consistent with the Constitutions of the United States and Arkansas, instruct its citizens which God to worship, forbid its citizens to use a particular deity’s name in vain, or require sabbath observances for religious purposes,” it asserts. Included as plaintiffs in one of the complaints are a Jewish rabbi, who asserts that the monument leaves out a number of other commandments in Scripture and trivializes sacred text, and a United Methodist clergyman, who believes that states shouldn’t endorse any specific religion, even if it is the one he professes. The other complaint was filed on behalf of several atheist and agnostic residents who take issue with having to look at the monument as part of their walking and bicycling group. “So long as the Ten Commandments monument remains in place, [they] will be forced to have unavoidable and unwelcome exposure to the Ten Commandments monument in the future each time [they] follows [their] path across the grounds of the Arkansas State Capitol during [their] regular recreational activities unless [they] alters [their] route solely to avoid coming into unwanted contact with the government-endorsed monument containing the words of the Decalogue,” it states. The lawsuits ask for the Ten Commandments display to be declared unconstitutional and for its removal to be ordered. Read the lawsuits here and here. Arkansas Sen. Jason Rapert and president of the American Heritage & History Foundation, who introduced the legislation that led the to monolith’s installation, said in a statement that the heritage and history of the monument must be defended. As previously reported, a new Decalogue display was just installed last month after a man with mental illness destroyed the original monument. A Christian film production company, a number of churches, and supporters from across the country all donated funds to help pay for the monument.